In a large bowl, combine all crab cake patty ingredients. Mix ingredients until well combined. Shape the meat mixture into approx. 10-12 small slider patties and set aside. Heat 1 1/2 tablespoons of oil in a large skillet over medium-high heat. Carefully place crab cakes, in batches, in the pan and fry until golden brown, 4-5 minutes. Flip the crab cakes and fry the other side, another 4-5 minutes. 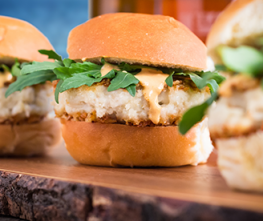 Place crab cake patties on buns. Top with Kelchner's Horseradish Remoulade Dipping Sauce and greens. Serve & enjoy!